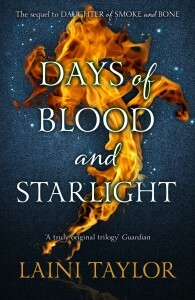 Days of Blood and Starlight is the sequel to Daughter of Smoke and Bone which continues the story of the chimeara Karou, and the angel Akiva. Karou is forced to take on the mantle of her dead mentor and become the new resurrectionist, the only hope of the ragged band of chimeara to survive the war with the angels. 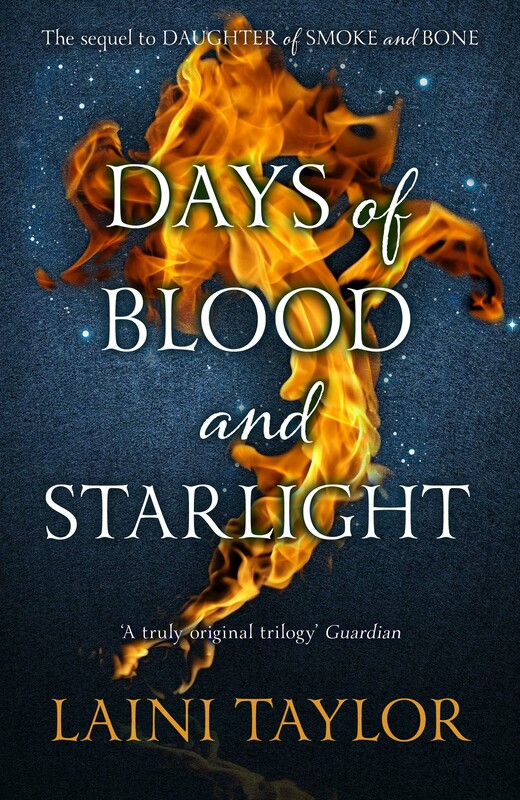 As a sequel, and having not read Daughter of Smoke and Bone, I approached Days of Blood and Starlight with a little trepidation; a trepidation that, unfortunately, was justified. The story assumes that the reader has read the previous book and immediately begins by referring to the events of that tale. A bewildering array of characters is thrown at the reader in the first few chapters with such little introduction that I found myself constantly having to flick back to see which character was which. Obviously, this is not a problem to those familiar with the previous novel but for new readers, it can be difficult to get into. However, once familiar with the characters and the general gist of what has happened, this confusion disappears and leaves a rich and fascinating story in its wake. On the surface the story appears to be the usual battle between angels and demons (called chimeara here) but it quickly establishes itself as more. The angels aren’t portrayed as the stereotypical embodiment of all that is good, with infighting, betrayal and a warmonger Emperor bringing them to life with a realistic culture. Equally, the chimeara aren’t the usual portrayal of demons; yes, they have horns and monstrous bodies, but they are shown with an all too human side with a sense of humour, loyalty and even love. This portrayal anchors the story and stops it becoming the usual tale of light against dark. The writing is polished with superb characters, all with their own flaws and well-described personalities. Add in a couple of humans and scenes such as a violin recital by campfire for a group of eight feet tall chimaera seem all too believable. Days of Blood and Starlight stutters initially for new readers but is a great story once you get into it and is definitely worth a look. It isn’t a typical fantasy story so if you aren’t in to that sort of thing, don’t dismiss this book as you’ll miss out on a treat. I think I might be looking for a copy of the first novel pretty soon.